There six machines in the park (that I saw, it’s possible I missed one). One is on the Frontier Trail in front of a building, one is in Frontier Town in front of a building, one is outside by the stuffed animal games, one is just inside the arcade on the Midway, one is out in front of the Maverick gift shop, and one is inside the Gatekeeper gift shop. Each machine has 3 designs and they’re all 51¢. 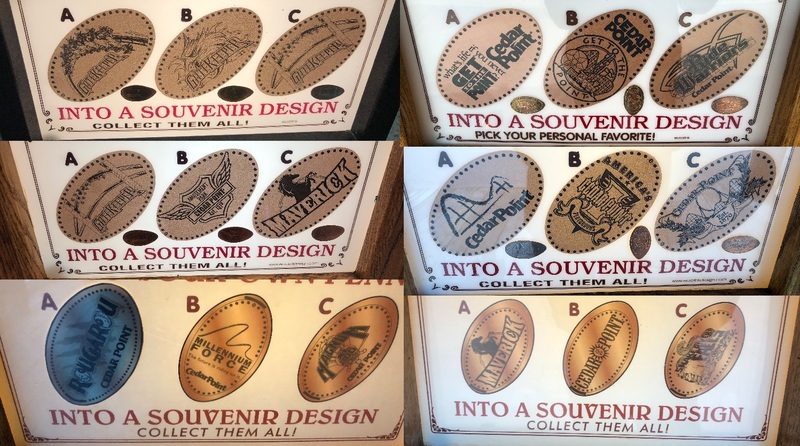 The designs are as follows: Maverick logo (at two machines), old-west Cedar Point logo, Snake River Falls logo, Rougarou logo, Millennium Force logo, Magnum logo, standard Cedar Point logo, “Cedar Point America’s Playground” badge, “Cedar Point Est. 1870” logo w/ roller coaster, banner, and laurel leaf, Gatekeeper gate logo (at two machines), “Cedar Point Amusement Park Est. 1870” winged badge, “What’s life if you never get to the Point?”, “Get to the Point” logo, Ride Warriors logo, Gatekeeper bird logo, Gatekeeper train logo.